We’ve had a really busy week here at Newlands, and it’s been great to see everyone enjoying themselves in the beautiful sunshine. This week in the blog we thought we’d talk about what makes the Jurassic Coast such a special area, and why we think a Jurassic Coast Camping trip is one of the best ways to spend your summer holidays in the UK. 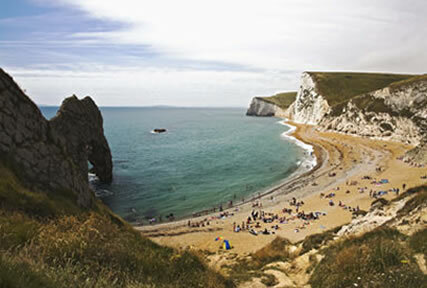 The Jurassic Coast is a 95 mile stretch of Devon and Dorset coastline famed for its stunning natural landmarks, beautiful beaches and abundance of prehistoric fossils. In 2001 it was awarded World Heritage Status, putting it in the same league as the Grand Canyon and the Great Barrier Reef in terms of unique natural beauty and scientific value. This kick-started a huge wave of interest in the region, with visitors flocking in from all over the UK and around the world. 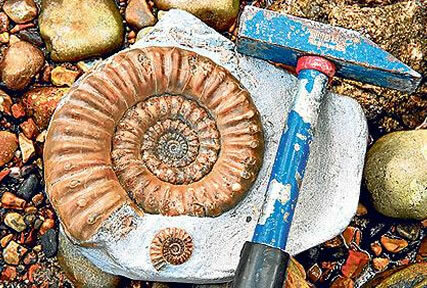 Hundreds of millions of years ago, the Jurassic Coast area was a tropical paradise teeming with an incredibly rich and diverse collection of marine life. The remains of these creatures can now be found embedded in the cliff faces or nestled amongst the rocks on the beaches around Lyme Regis and Charmouth. A day’s fossil hunting makes a great family activity – you can either join a guided expedition with local experts or simply go looking by yourselves. Either way, whatever you find is yours to keep! If you prefer to relax and put your feet up on your holidays, you will find a huge variety of beautiful beaches along the coast, ranging from large sandy tourist hotspots to tiny, quiet, hidden-away coves with not a soul in sight. You will also have the opportunity to enjoy some of the area’s fantastic food and drink, including freshly-caught local fish and seafood. There is also the famous Dorset Cream Tea, which is perfect for an afternoon sat outside a café in one of the many charming, beautiful villages dotted along the coastline. There’s still time to book a late summer break – for a great deal on a Jurassic Coast holiday check out our website for prices and last minute offers!